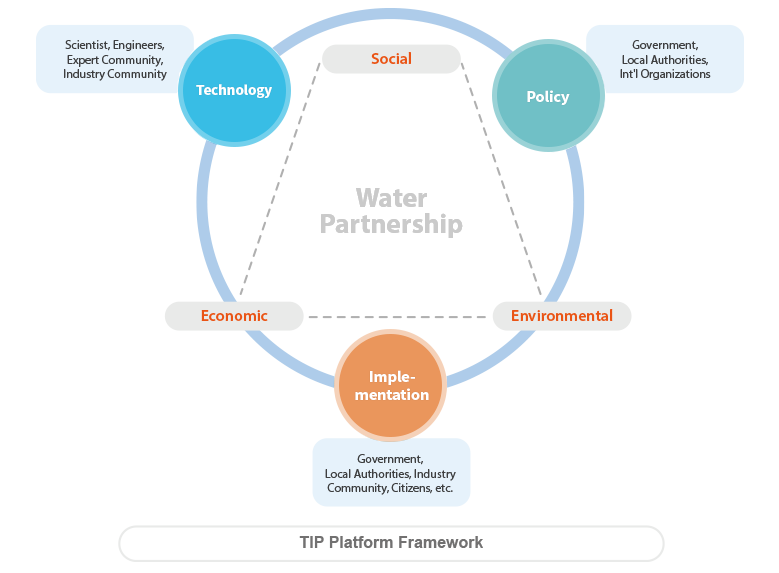 TIP Platform focuses on a number of areas where science and technology provides a major opportunity to innovate water resources management and environmental security, simultaneously, where the development of relevant policy offers socio-economic opportunities and supports the process of technological application and its development. A number of areas have been carefully selected and are described below. Current and future water solutions are highly dependent on the use of scientific research, new technologies and innovation processes. The challenges for water resources management are complex, which include rapid urbanization, population growth, climate change, industrialization, a surge of energy demand, disaster impacts, water-energy-food nexus, and massive pollution of water, soil and air. Many of them form the basis for the discussions of global community around the Sustainable Development Goals (SDGs). In the whole process, policy making process and development considering science and technologies became more important and the linkage between two pillars, technology and policy, will be the key to making implementation possible for all actors. Science and technology and its ties with policy making do not appear to tackle all the mounting challenges in the water sector. These circumstances signify the urgency for ground-breaking and brand-new commitment from the perspectives of technology and policy simultaneously so as to make good practices. To properly address above challenges, we need to focus on and invest in the processes of innovation in the water (and related) sectors as follows: Firstly, it is to create a better understanding on how innovation and application of technologies in the water sectors works and how it can contribute to profound changes at scale. Secondly, it requires to renew political will from key decision makers in both the public and private sectors to invest in water innovations, from fundamental research, to piloting new technologies, to wide scale applications. Finally, it also requires the mobilization of an entrepreneurial spirit which not only provides practical solutions for problem owners but also helps making technologies useful for industries. The objective of TIP platform is to promote global discussion on practical solutions for water challenges at various scales. The platform will be designed to provide practical and innovative guidelines to those who seek for practical know-hows and lessons learned from successful implementation of water policies. TIP also aims to provide market places with the emerging science and technologies and engineering services for active engagement in global water issues. The activities of TIP in KIWW will develop the robust network for international cooperation in water sectors and provide practical advice for further projects and future collaborative works. Technology in Feasibility study, Design, Construction, Operation, Maintenance, Monitoring, Treatment, Restoration, ICT including Artificial Intelligence (AI), Big Data, etc.  * Click to download the pdf file. Focus Areas below are aimed to define practical solutions for achieving Sustainable Development Goals on water and consequently provide action tools and tangible strategies. Smart water management with the Information and Communication Technology (ICT) is an essence of efficient, safe and sustainable and smart water management and one of the dominated and rapidly changed technologies used in a variety of fields in our current life. The technology has quickly evolved that it might become obsolete without being sufficiently applied to various processses of water management. The scope of ICT application has been limited to the remote data acquisition and sending for monitoring and control of the system, but now many innovative technologies such as mobile technology, internet of things, big data, and augmented reality become available for the application to water management. New applications and best practices of those technologies concerning water resources management are necessary for rasing issues. Water recycling can contribute to enhancing the sustainability of the global water and environment, which suffers from climate change, excessive carbon emission and energy consumption, water deficit, and floods. It is a series of processes of reusing treated wastewater for industrial processes, agricultural and landscape irrigation, toilet flushing, and ground water recharge. The challenges associated with the water recycling and reuse can be wastewater technologies, legal and regulatory preparation, and social agreement. Efficient and appropriate technologies are required for diverse purposes of water use. It is also inevitable to set up relevant laws and regulations and forms a social consensus concerning they recycling and reuse process in the implementation. Socio-economic development is closely related to water resources development and management due to the complicated interactions between water and human activities. Water serves as an indispensable resource and a positive or negative function for socio-economic development such as social and economic resource, a media for energy generation, and natural amenity and flood and disease transmission through water-borne diseases. The pervasive characteristic of those functions attribute to creating such an intricate relationship between water and socio-economic development. The related issues on water for socio-economic development include the assessment of the social, economic and environmental impacts, land use, adoption of an integrated approach, effective communications in the socio-economic process, adaptive decision-making and implementation for socio-economic demands, and incorporation of social issues and values into decision making process. Water governance is important in developing and managing water resources, and contributes to tangible public policies and implementation through a shared responsibility across all stakeholders, based on effectiveness, efficiency, participation and trust. The stakeholders include policy-makers, government agencies, water industry, civil society and NGOs, who play an important role in enhancing the water resources management towards equity, economic efficiency, and environmental sustainability. The integrated water resources management is one of the conceptual methodologies that reflect the effective governance. Partnership, one of the important factors for good governance, is one of the most effective ways to manage or develop the water resources, which have a characteristic of spatial and temporal availability and movement. Partnership can have various types of the organization scheme such as public-public or public-private partnerships, etc. depending on the characteristics of project objectives. Since the collaboration of partners also creates a synergy in achieving the goals of water management, the partnership among related stakeholders needs to be issues for efficient water management. Sustainable implementation is the main factor in success of carrying out water-aid programs. According to the report from the International Institute of Environment and Development (IIED), about 300 million dollars wasted for water infrastructure because of unsustainable aid projects. Water Aid indicates two major problems in the current sustainability framework. One is that communities, government agencies, and service providers have a limited capacity of the knowledge to maintain systems. The other is a lack of revenue to cover the full operation and maintenance. The factors affecting the sustainable implementation are user participation, monitoring system, quality of implementation and technology, user’s contribution to capital. For example, the sustainable implementation can be achieved by building the capacity of stakeholders for various projects including WASH (Water Sanitation and Hygiene) projects, sharing experiences of raising funds, and setting tariff structures for sustainable water-aid programs. 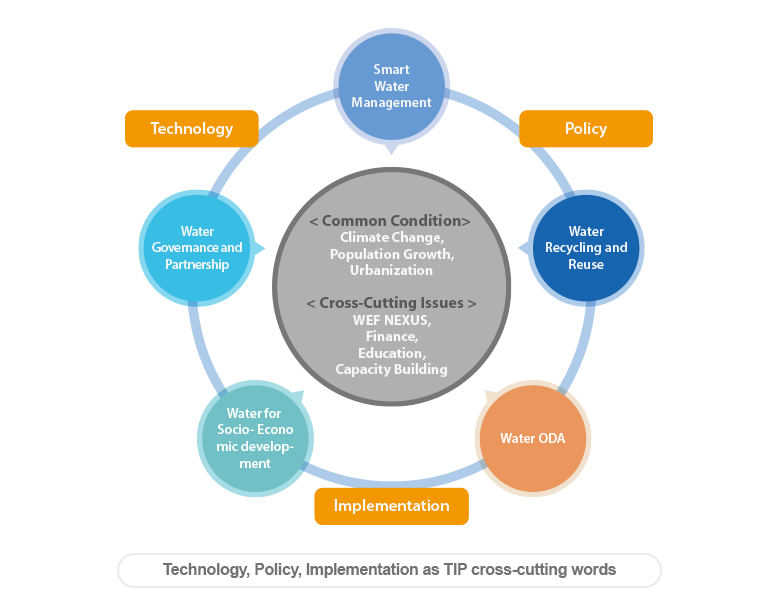 The TIP Platform is designed to provide practical and innovative guidelines to those who seek for practical know-hows and lessons learned from successful implementation of water policies and water related science and technologies. Its objective is to promote sharing ideas and finding practical solutions to global water challenges. It also aims to provide market places with the emerging science and technologies and engineering services for active engagement in global water issues. For organizing a session under the TIP Platform, please select one of the five focus areas of TIP Platform and submit a session proposal that addresses the theme of the focus area. Each organizer is responsible for creating and managing the proposed session maximum 120 minutes during the KIWW 2019 (Sep. 4th - 6th, Daegu EXCO, Rep. of Korea). * Please check the TIP Platform concept note for detailed background and focus areas description. Proposals should be text only and follow the template and be submitted by the e-mail (tip_kiww@koreawaterforum.org) by 30 May. The session may have keynote speeches, presentations, panels, round table discussions, talk shows, group work and posters. Please refer to the TIP Platform session proposal guideline and information, and download the proposal templet for an apply. The results of the 1st AIWW have been successfully developed and integrated into the 8th World Water Forum’s main agenda. Especially, SWM (Smart Water Management) is a main trend in water related technologies. Every country and entity are interested in this topic and have been developed it in their own way. As the AWC pursue a platform to provide real solutions for water problems, AWC would like to promote SWM technology in order to ensure that all AWC members and interested participants can reach its full potential impact on the world’s most challenging water issues with SWM technology. The session will introduce latest main trend of SWM technology. This session will provide insight and understanding of not only SWM technology concept in water sector but also implementation case study of each AWC’s country and agency. The session will be an opportunity to start laying out the foundation of the SWM implementation and all participants can share valuable know how and strategy to adapt SWM technology for water resources management. The trend of water market led by SWG technology and its prospect. Best practices practically implemented in leading countries on SWG technology. The evolution of cutting edge technology such as sensors, AI, IoT, Big data in water sector. •	Fostering an international closed-knit community from which ideas and methodologies of people can be better shared, combined and integrated as well as widening the horizons. The Smart Water Management (SWM) Project showcases exemplary smart water management case studies from both developed and developing countries from around the world, to demonstrate how SWM can be successfully adopted in a wide range of scales, contexts, locations, and can assist in resolving a wide range of water challenges. Through this project valuable lessons have been learned on the enabling factors and barriers faced by those who have implemented SWM solutions, along with the potential for SWM to assist in achieving the Sustainable Development Goals. In this session we will share with you the key lessons learned, links to the Sustainable Development Goals, the enablers and challenges to successful SWM implementation, along with outlining how policy can support SWM implementation in the future. We will also share the transfer and scalability of smart water solutions and the potential for Smart Water Management in developing countries. This session will add to the global discussion of addressing problems challenging adequate management of water quality around the world. Objectives of the session include sharing new knowledge of emerging priorities in the field based on recent research and developments, highlighting remaining gaps, identifying and discussing problems regarding water quality, engaging/encouraging participant involvement and interaction, and connecting water experts with similar water quality concerns. The result of the workshop, group discussion and vote will be to scope the most important water quality challenge(s) that water managers will confront in the near future and beyond, discuss directions for research and policy, and the interface between science and policy, to address them and to provide a practicable focus to the global agenda in this domain. This session will bring together public and private sector stakeholders in the area of water reuse and will discuss existing challenges to promote water reuse in developing countries, and identify potential solutions based in policy interventions, technical innovations, and innovative financing..
10:15–10:25 (10’) - Importance of water reuse in integrated water management and climate resilience. 10:55 – 11:25 (30’) Panel Discussion All speakers and water sector government officials from developing countries will be invited. Globally, more people live in urban areas than in rural areas, with 54 per cent of the world’s population residing in urban areas in 2014. According to the world Bank, 30 percent of the world’s population was living in urban areas, and by 2050, 66 percent of the World’s population is projected to be urban. Thus, in the coming decades, the cities will have an unprecedented growth in the developing world. The phenomenon will be particularly striking in Africa and Asia, where the urban population will double between 2000 and 2030. Indeed, by 2030, both large and small cities in the developing countries will house 81 % of the urban population of the planet. Access to drinking water and sanitation will continue to be in these cities a daily struggle for hundreds of thousands of city dwellers. The lack of basic sanitation facilities undermines the efforts to end extreme poverty and diseases in the poorest countries in the world. This mainly concerns sub-Saharan Africa, where nearly 520 million people do not have access to adequate sanitation facilities. This session provides an opportunity to discuss sanitation chain through the stages of collection, storage, transport, treatment and recycling/reuse of faecal matter. Participants consider innovative technological, social and economic models that can accelerate progress towards achieving safely managed sanitation services. Participants also examine ways of sustaining these services in a global context of rapid urbanization and high population growth, especially in developing countries with limited financial resources. The objective of this session is to promote a global discussion on practical solutions for water challenges at various scales in various countries. The session will provide a practical and innovative methods of wastewater management focusing on the wastewater recycling. It provides practical know-hows and lessons learned from successful implementation of wastewater management policies from different continents. The session also create a platform that helps to develop the robust network for international cooperation in wastewater sectors and provide practical advice for further projects and future collaborative works. In general, it will contribute a lot of knowledge and practical solutions to reach SDG target for sanitation (SDG 6). In Ethiopian Addis Ababa, wastewater is being collected either by seware lines or vacuum tracks and treated by Activated sludge system or UASB, then finally released the treated wastewater for urban agriculture. Best practice, challenges and opportunities to be learned by other world??? An integrated manure management system was investigated that includes a biological process for removing dissolved contaminants from manure while producing biomass that is subsequently converted to bioenergy products using hydrothermal processes. Session audience (Different counties) Audience categories but not limited to the following are expected in out session. The sustainable development goals (SDG) approved in 2015 identified the importance of sustainable water management promotion for safer and resilient cities. The session will include four presentations that address the problems in shifting from traditional urban design to integrated urban water planning and design in cities also known as water wise cities through the application of low impact development (LID) strategies. These presentations are beneficial to developing and developed countries since it covers principles of water wise cities, livability, efficiencies, and a sense of place for urban communities ensuring water sustainability. The session will highlight the importance of the collaborative effort of the government as well as the urban water professionals in addressing the problems brought about by traditional urban development. This session aims to introduce the current trend of urban water management in developing and developed countries. Particularly, the application of LID strategies for sustainable urban water management as technological support for the restoration of natural watershed hydrology will be discussed. Lastly, this session will identify the challenges and future concerns that need to be addressed in water wise cities adaptation for urban water management through LID application. At the end of the session, speakers and participants, especially the urban stake holders, are expected to understand the necessity of incorporating LID in urban planning and design towards the development of water wise cities. Human well-being and environmental sustainability depend on access to water of appropriate quality, recognised in SDG target 6.3, the need to improve global water quality under the broader goal of ensuring safe and sustainable water for all (SDG 6). With more demanding pressures on available resources, water quality management is increasingly essential for a more balanced approach to the management of water resources. In order to target sound water resources management and policy responses, the session builds on the IWRA 2018 “Question of the Year” (https://www.iwra.org/questionoftheyear/) to suggest water quality governance problems identified by experts and open a dialogue with the water community with the purpose of sharing insights and exploring new ideas. Focus will be on current water quality considerations such as contaminants of emerging concern, using water of the appropriate quality for use and considering the science policy interface. This session is a workshop style event, with the inclusion of an expert panel who will also aid in supporting and guiding the discussions. The program begins with short presentations by four water quality experts on their answer to ‘what wicked problems face water quality managers?’ These presentations will be followed by a workshop, inviting participants to share their own ideas on the topic in small groups led by a panellist. After the smaller group dialogues, there will be a full group discussion of the workshop’s outcomes, concluding with a vote on which problem deserves the most attention on the global stage. This session will add to the global discussion of addressing problems challenging adequate management of water quality around the world. Objectives of the session include sharing new knowledge of emerging priorities in the field based on recent research and developments, highlighting remaining gaps, identifying and discussing problems regarding water quality, engaging/encouraging participant involvement and interaction, and connecting water experts with similar water quality concerns. The result of the workshop, group discussion and vote will be to scope the most important water quality challenge(s) that water managers will confront in the near future and beyond, discuss directions for research and policy, and the interface between science and policy, to address them and to provide a practicable focus to the global agenda in this domain. With the global population continuing to grow rapidly, demand for water is expected to increase by nearly one-third by 2050, while our freshwater ecosystems are degrading at an alarming rate 64~71% of the natural wetland area worldwide has been lost due to human activity in the last century. Furthermore, water pollution has worsened in almost all rivers in Africa, Asia and Latin America since the 1990’s “We need to deal with the water paradox,” said Erik Solheim, head of UN Environment, calling attention to the need to work together towards a solution for our water challenge. “Water is the essence of life, but we don’t save it enough. It’s time to change mindsets, it’s not about development versus the environment.” Likewise, as more than 2 billion people lack access to safe drinking water and more than double that number lack access to safe sanitation, the international community is drawing attention to nature-based solutions for the water challenges of the 21st century on this session. The Sustainable Development Goal 6 Synthesis Report 2018 on Water and Sanitation reviews the global progress made towards achieving Sustainable Development Goal 6 (SDG 6) of the 2030 Agenda for Sustainable Development. It builds on the latest data available for the 11 SDG 6 global indicators. In this forum, we will listen to the efforts of the international community for achieving SDGs from the task force coordinator and director, UN WWAP. Through this keynote speech, we will also learn about what challenges and cooperation of the international community has left over. This forum highlights the unique and fundamental role that nature-based solutions play in regulating the water cycle, keeping freshwater clean and improving the water security of our water cycles. Sustainable water security requires an integration of traditional engineering solutions with nature-based solutions, which in essence are services that conserved functioning of natural systems and can contribute toward solving challenges such as water insecurity, climate change impacts and human health issues related to environmental degradation. Nature-based solutions, often referred to as “green infrastructure”, address water-related problems at the landscape level, and can work alongside gray infrastructure, resulting in cost savings by avoidance of construction and operation of complex water management systems. *Simultaneous interpretation will be provided in Korean and English. Better understanding of advantages and disadvantages of NBS, based on field applications. Identifying opportunities and barriers driven by current regulatory frameworks and management practices, and how the former can be reaped and the latter overcome, for sustainable implementation of effective NBS. Developing an NBS proof of concept regarding scientific, economical, and political challenges for sustainable development. The Water for Sustainable Culture, Sciences, and Technologies Side Event is a multi-collaborative side event that will focus on water projects. The projects, which will be discussed in the side event, are from youth actions and institutional research with integrating the importance of culture, science, and technology. In the event, there will be a talk show and a poster exhibition. To introduce an Indonesia cultural booth to international delegates that will be organized by IGAF, YUNGA UNFAO, BCFN YES, and PERPIKA. The development of hydropower resources has the potential to spur economic growth, reduce poverty, and bring about sustained improvements in human welfare. However, an acceleration of water resources development creates challenges such as how to ensure the expansion is environmentally and socially sustainable. International financial institutions such as World Bank (WB), Asian Development Bank (ADB), and etc. have developed theirs guideline and management tools to consider the impact on the environment and society at the planning and implementation stages of the project. Also, the private sector adopts this guideline to manage the E&S risks. The E&S session will bring in E&S experts for a speakers, which will be an opportunity to share knowledge, experiences and also learn more about the E&S issues in various case. Infrastructure developments in the water sector often come at a high environmental cost. In Asia and the Pacific, this is exemplified by the recurring international concerns surrounding the development of dams on the region’s rivers and the associated impacts on communities, livelihoods as well as ecosystems. Science, engineering, Technology and Innovation (SETI) has the potential to effectively address this issue and bring about a more harmonious relationship between infrastructure needs and environmental sustainability. New and emerging fields of research - from ecohydrology to interdisciplinary engineering to innovations in communication technologies - have the potential to generate new knowledge and approaches that serve to connect infrastructure and environmental needs – with potential benefits before, during and after the implementation of infrastructure projects and developments. The session brings together a range of regional perspectives on the potential and available modalities for a robust and targeted contribution of SETI towards the bridging and harmonization of infrastructure and environment. The session introduction will be delivered by Dr Hans D Thulstrup (UNESCO Regional Science Bureau for Asia and the Pacific) and features the following presentations: 1) “Effective Water Governance and Challenges through Global and Regional Processes” by Prof Soontak Lee (World Water Council, Republic of Korea), 2) “Perspective of Hydropower and the Sustainable Development Goals: Focus on Nepal and beyond Borders” by Dr Jagat K Bhusal (Society of Hydrologists and Meteorologists, Nepal), and presentations by water related UNESCO Category 2 Centre: 3) SETI education for a sustainable future by Ir Rohani Ahmad (The Regional Humid Tropics Hydrology and Water Resources Centre for Southeast Asia and the Pacific, Malaysia), and 4) “Engaging with the interlinked SDGs” by Ms Bitna Lee (International Centre for Water Security and Sustainable Management, Republic of Korea). This session aims at making a targeted contribution towards SDG6 (Water and sanitation for all) as well as SDG 9 (Industry, innovation and infrastructure) and SDG 17 (Partnerships for the goals). The session will result in succinct recommendations in the form of a pathway for the practical application of SETI towards infrastructure and environment and towards the implementation of SDGs 6, 9 and 17. 13:00-13:15 (15’) Opening remarks and session introduction Dr Hans D Thulstrup, Senior Programme Specialist, UNESCO Regional Science Bureau for Asia and the Pacific. 13:15-13:30 (15’) Effective Water Governance and Challenges through Global and Regional Processes Prof Soontak Lee, Governor, World Water Council. 13:30-13:45 (15’) Perspective of Hydropower and the Sustainable Development Goals: Focus on Nepal and beyond Borders Dr Jagat K Bhusal, Ex Chairperson of Electricity Tariff Fixation Commission of Nepal, Society of Hydrologists and Meteorologists. 13:45-14:00 (15’) SETI education for a sustainable future Ir Rohani Ahmad, Director, The Regional Humid Tropics Hydrology and Water Resources Centre for Southeast Asia and the Pacific. 14:00-14:15 (15’) Engaging with the interlinked SDGs Ms Bitna Lee,Programme Specialist, International Centre for Water Security and Sustainable Management. WWCF 2018 will serve as an exclusive platform for city leaders and water experts to discuss water-related issues and solutions for each city and share best practices and policies related to water management. WWCF 2018 is a forum for discussing the way to utilize water management and water technology / water industry development as a tool for creating attractive, livable, resilient and prosperous city. All participants will gain new insights into the successful implementation of water policies, how to engage stakeholders and how to collaborate with participating cities. Mr. Tom Kunetz, President, Water Environment Federation, U.S.
Payments for Ecosystems Services (PES) in general refers to market incentives for the provision of public goods within the field of environment. Ecosystem services refer to the benefits people obtain from ecosystems. IWRM is a process that promotes the coordinated development and management of water, soil and the other related resources in order to maximize economic results and social wellbeing in an equitable manner, without compromising the sustainability of vital ecosystems. Ideal IWRM implementation has rarely achieved due to inadequate financing and fractured governance schemes that continue to manage ecosystems from sectoral perspective. Ecosystem approach helps in integrate the sectoral goals under the umbrella of watershed management. Economic instruments such as PES can also help in providing financial resources for IWRM implementation while it can also provide a tangible framework for stakeholder participation. In this session, a series of presentation assist in explaining how moving from a more traditional form of IWRM to one that incorporates ecosystem services, provides financial incentives and markets for managing and providing healthy and sustainable ecosystem services. To solve world water problems, SDG is proposed. To achieve it, we need a new paradigm of water management including Nature Based Solution (NBS), using IT, and involving stakeholders. NBS does not require energy, do not make conflict, and do not make residue. We need appropriate technologies instead of high tech. For water, community-based rainwater harvesting is suggested as an NBS since the community involvement is essential. Moreover, several successful case studies exist. For sanitation, resource circulated sanitation is suggested as another NBS which has less water and energy consumption and utilized separately treated urine and feces as fertilizer or soil conditioner. The economic evaluations of several sanitation systems are compared while the demand for a new performance index of sanitation is demonstrated. Several community-based movements are suggested to involve the society using appropriate technology via IT. Good examples of such movements are the activities of Water and Sanitation Appropriate Technology (WASAT) center. Introducing NBS approaches enhanced with the application of IT and involvement of stakeholders for global water and sanitation challenges. Demonstrating community-based rainwater harvesting and resource circulated sanitation as NBS toward SDG6 by introducing successful case studies. Economical comparison of different sanitation options and demonstrating a new performance index for sanitation. Application of IT to provide appropriate technology for water and sanitation approaches through several activities of WASAT center. This session will explore the ways to promote information sharing across the institutions in Myanmar and development partners for Myanmar to address flood risk management. In the first part, the challenges in dealing with flood risk management in Myanmar and activities addressed by multi-stakeholders of Myanmar will be shared. Then in the second part, main development partners from Japan, Korea, Netherlands, and World Bank will make presentations about their programs/projects that provide the research and technical support for the flood risk reduction and the integrated water resource management in Myanmar. In the panel discussion, the session aims to identify the similarities and differences of research and technical supports by the development partners. The Myanmar representatives will share what technical supports will be further needed, followed by the panelists’ discussion on whether and how each development partner can work together to promote information sharing across the institutions in pursuance of social residence from the impacts of flooding in Myanmar. The objective of this session is to discuss how to facilitate effective coordination among the development partners by sharing information toward flood risk management in Myanmar. The output of this session is to identify what each development partner is doing and the ways to develop information exchange platform among the development partners for Myanmar to strengthen local human capacities in addressing the flood risk management utilize holistic and participatory approaches. It is also expected to examine the ways to develop a disaster risk management platform where usable meteorological and hydrological information will be provided for local community in Myanmar as an obligatory for its sustainable development, so as to assist making informed decision-making for national and local development planning possible as well as promoting public and private investment.